I've been very blessed in my beauty blogging adventures. I love hearing the agony/glee of friends and readers who tell me now they have to have a blush, a lipstick, a Le Metier palette; Messy Wands was nominated for an award by Lucky Magazine (still can't believe it) during the Fashion and Beauty Bloggers conference (FABB) last September; but most of all, I just love doing it - the writing, photographing, planning, thinking what to feature next... This blog has taken over half my life, and I wish it would take up more. 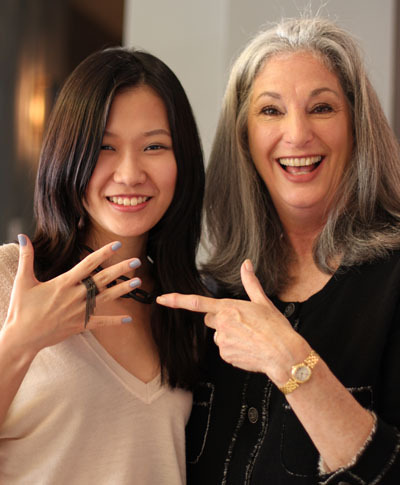 But really, never have I imagined to get an e-mail from Glamour inviting me to a bloggers' breakfast where I get to meet Essie Weingarten. I mean, Essie Weingarten in the flesh?! You have no idea how many times I reread the e-mail, pinching myself, Googling it to see if it was some sort of a scam (of course it wasn't. but still!). Disbelief aside, I wasn't about to let that opportunity slide. Class be damned (well no, like the proper student I am I asked for my professors' permission), I woke up at 3.30a.m. and got on a 6a.m. plane for a one day trip to New York City. The event was held at the tenoverten (112 Reade St) salon, a calm oasis amidst the rampant construction happening around it. I went in and was greeted by breakfast and handshakes and the sight of other bloggers (I was too overwhelmed to mingle. 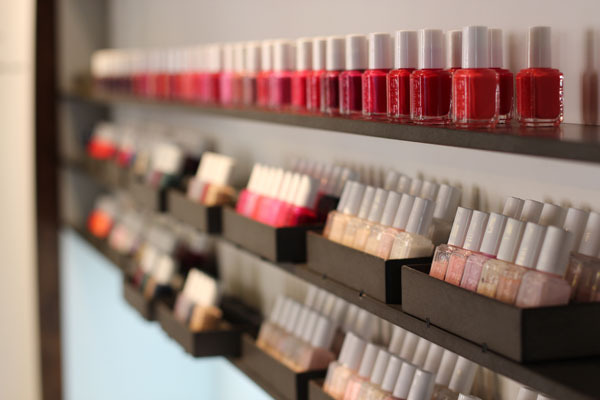 sigh) and this amazing wall of Essie polishes. Then, a manicure using my choice of the Essie Winter 2011 Collection colors! Halfway into my manicure, I noticed Essie walking into the spa. She went from blogger to blogger (there were about ten of us there) and spoke to each and every one of us. I couldn't move from my spot, but couldn't help craning my neck to hear her speak. Essie was an animated speaker, and I wanted to catch every anecdote. What I loved most about meeting her was finding out how approachable she was in person. There was respect and certainly a sort of reverence when we were speaking to her, but it was also like a few girls sitting around a nail salon, just chatting away. From the way she talked about her products, to refusing to answer when asked which of her colors was her favorite (though she conceded that Ballet Slippers had a special place in her heart), her passion for polish shines through every story she tells. I'm a stranger to the interviewing (or effortless casual talk) game, but I did ask her if she still had every Essie color ever created. She said they have a library of every color they've made, but for the some lost in a fire in 1991. Oh what I would give to visit that nail bank. I'm glad I got to meet Essie. This is a woman who's been doing her job for decades and still loves every minute of it. She told us she wanted to thank bloggers for doing what we do, but I wanted to thank her for the inspiration. As a graduating senior trying to plot my future within the coming months, fearful of making a misstep, ending up at a job I might loathe, I can't express just how happy meeting her makes me. That's me with two hours of sleep after a harried trip from Boston. I wouldn't have published it if I didn't have Essie pointing at my manicure, which makes this photo absolute gold. Like the timid mouse I am, I waited till all the other bloggers left to ask Essie for a golden nugget or two, and here is what she has to say to us newcomers: Stay true to yourself, be authentic and follow your own voice. With that you'll succeed. I have photos and swatches of Essie's Winter 2011 Collection coming up next. Many thanks to Glamour Magazine and Essie for this opportunity. OMG that is amazing! You look so happy in that photo with *the* Essie. :) Thanks for sharing your experience. HOW EXCITING!! 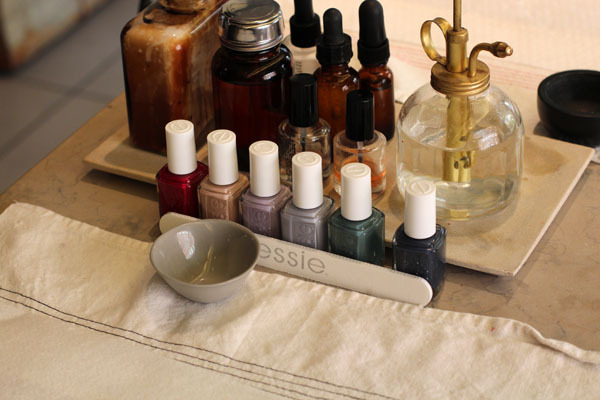 I love Essie polishes - great post! That's is so awesome and I'm loving the color you chose for manicure. Is it a lavender? A grayish-periwinkle? Ooh it looks like you have on Cocktail Bling! I'm eyeing that one and Bangle Jangle. Did you like the color? It's great to hear that Ms. Weingarten is such a thoughtful, supportive woman as well as stellar entrepreneur. I'm glad you got to meet her. And congratulations on your Lucky Magazine nomination! Ahhh! So cool! That pic of you and Essie is great! Oh my god! Congrats :o) The event (and Essie, eeee!!) sounds amazing. lol best picture ever! love how ecstatic essie looks. Ps I love the pic eith Essie! Thank you all! I'll have swatches of the collection up tomorrow. As well as an on nail shot of Cocktail Bling - my fav of the collection. A belated congrats! That sounds like such a fab day!